Every Sunday, we go to an awesome local bakery. This past weekend, I bought a loaf of some good bread from Atwater’s. We made sandwiches the day before, but I had to save a few slices. I love using good bread for French Toast. I cut the slices about 1/4 inch thick and soak them in a mixture of egg, almond milk, (you can use regular milk) and a few spices (cinnamon, nutmeg, clove). 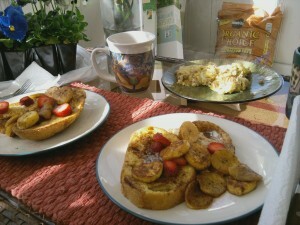 The key to good French Toast is “soak time.” Good bread will not fall apart in the egg mixture. I let it soak for about a minute and then I turn it over and let it soak again on the other side. Repeat several times. I do this for the better part of five minutes, until the bread is saturated, but not soggy. Once the bread is ready, melt a little bit of butter in a skillet on medium heat. Place the egg battered slices in the pan and cook for about 2-3 minutes on each side, or until the pieces are slightly brown. If you cook it too high, the middle won’t be done. I suppose the heat can’t be TOO LOW, but people have stuff to do and it would take too long LOL If you choose, you can sprinkle the spices on the bread in the skillet instead of, or in addition to, putting it in the egg mixture. I’ve been known to season my French Toast with the Oregon Train Chai Mixes. So good.